itinerary for lovers of art, history and gastronomy. to hotel for overnight stay. for embarkation on River Baroness. Latin Quarter and the Île de la Cité. where you will be transferred to the hotel. Site- visit the Cathedral of St. Peter and St.
view of the city lights. village and learn more about daily life. a hike up to the castle ruins. see the sights on foot with a local expert. 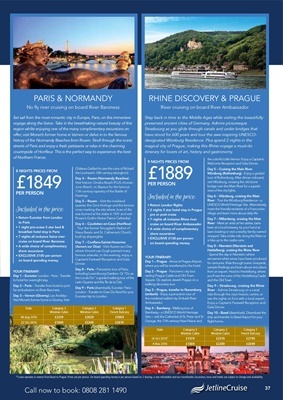 *Cruise operates in reverse from Basel to Prague. Prices are per person. On board spending money is per person based on 2 sharing, is non refundable and non transferable. Excursions, tours and hotels are subject to change and availability.